SPONSORED CONTENT: THERE’S A LITANY of words that come to mind when most clients think about bus seating and McConnell. Comfort and support. Industry leader. Safety and quality. Honesty and integrity. Just one of many popular bus seat styles from McConnell. And that’s because after more than 60 years in business this iconic Australian company has forged its solid reputation in the transport seating game from epitomising these qualities in everything it does when it comes to conceptualising, designing and delivering world-class bus and rail seating in a tough and competitive market. ABC spoke exclusively with McConnell GM James Lowe about its new Broadmeadows, production facility, company expansion and future direction in the local bus-seat game. "We’ve been at the new location for a bit over a year now. We are working out of a 15,000sqm facility under one roof, whereas we came out of Coburg working from four separate factories, so we’ve been able to streamline the operation and get a lot more productivity out of the factory," Lowe explained. "When you are working out of multiple warehouses you lose that efficiency, so it’s been refreshing to get into a pretty modern factory and the staff are loving it." He says McConnell is still very much invested in local manufacture. Its latest addition is a robotic welding cell to better its efficiencies and it’s also invested in a CNC pipe bender. It’s continuing to invest locally; its tooling is made locally and the majority of its suppliers are local, so McConnell is setting itself up for the long term. "The threat is always from imported products, but seats are a customer’s choice – a lot of importers bring in buses without seats because they don’t know the application or the client’s requirements. The seats need to be localised, so we think we have a pretty good position," Lowe explained. "And that’s because of ADRs, yes, but also even our non-ADR route bus seats – we do a lot of high-volume [route bus seats] for most of the major operators, so I think we are in a good position to continue to service the bus industry across the board." "Buses are the bulk of our business, as opposed to rail, but we did buy Loco Seats Australia in Brisbane last year, which really focuses on the rail driver seat space, so we now have a facility in Brisbane concentrating on rail seat refurbishment – mainly driver’s seats. So that’s a little bit of diversification, which is not a bad thing. "Domestically, we are now located in Melbourne and Brisbane; we have about 60 staff in Melbourne and about 15 in Brisbane. As everyone knows, the Australian bus market is very insular, so we have very long-standing relationships with a lot of chassis suppliers, body builders and operators. We work well across the full spectrum," he explained. "We are dependent on the client’s satisfaction, though. Usually if they are happy with our product they’ll continue to buy, but if not then they will look elsewhere. We are really only as good as the last set of seats we have manufactured and supplied to the market. "And we’ve invested in a lot of training. All production staff have completed a Certificate I and II in Competitive Lean Manufacturing and our team leaders and office sales staff have completed the diploma course." Founded in 1952 by James ‘Jim’ McConnell, the second generation – and probably future generations – of McConnell is continuing the tradition of quality work to this day. 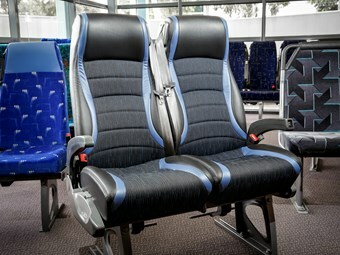 Active in market segments requiring passenger seating for luxury coaches; day charter and school buses; urban buses; and rail and light-rail systems; McConnell is the preferred choice for many Australian and New Zealand bus operators, with the Melbourne – and now Brisbane-based company – making and selling seat systems in all the above categories. Its commitment to quality and safety has made McConnell Seats Australia the major force and market leader in the extremely specialised area of passenger transport seating, according to the Melbourne-based company. Now mainly located under one roof of a large 15,000sqm modern factory in the suburb of Broadmeadows, north of the Melbourne CBD and south-west of Tullamarine Airport. McConnell provides the best in public transport seat design and manufactured products and services. Its seats are completely manufactured in-house from the metal fabrication right through to the final trim. A high level of quality is assured through adherence to its quality management system modelled on AS/NZSISO9001:2008. Facilities include professional engineering and design personnel. Seat strengths and load applications for new designs are analysed and tested in-house. Products and components are certified to Australian Design Rules (ADRs) and recognised standards. And in a market becoming increasing safety conscious, McConnell says through its marketing and design team – plus the latest in production and construction techniques – it can offer far superior services and bus-seat products. And it’s been doing it for decades. Its aim? Put simply and in its most respectful terms, McConnell, "aims to be a globally competitive supplier to all aspects of the commercial transport seating industry by providing total satisfaction that surpasses customer expectations". And it achieves this by the continuous improvement of products, quality, and an unrelenting commitment to customer service through the development of its highly skilled and innovative staff, it states.